Genome Adventures aimed to engage the general public in Botswana with genomics and biomedical research through a combination of a comic book series, social media outreach and interactive workshops. HIV/AIDS has had a vast negative effect on Botswana, triggering the government, and donors around the world, to develop programmes to combat the pandemic. The Botswana-Baylor Children’s Clinic and the University of Botswana are among the organisations that have spearheaded this movement by setting up a Collaborative African Genomics Network (CAfGEN). The two organisations have partnered with the University of Makerere in Uganda to undertake the project. The focus of CAfGEN is to look at the genetics of infants born with HIV and contact TB, particularly focusing on infants with rapid progression and long-term non-progression of the two diseases. Simply put, scientists are exploring the genetic differences between children who slowly get sick from HIV and those who get AIDS faster. The project, which started in November 2014 in the country’s capital Gaborone, is a H3 Africa consortium project. 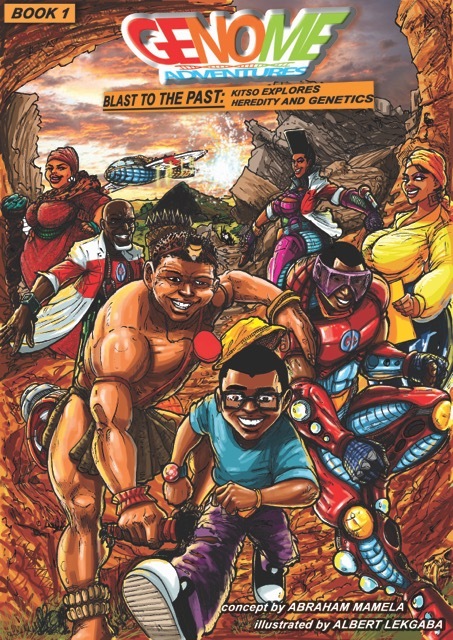 The main aim of the Genome Adventures project was to use comic book art along with other medium such as workshops, media platforms (radio, newspapers and television) and social media to communicate and engage the public with biomedical research in Botswana, with a clear focus on genomics. The project was hosted by the Botswana-Baylor Children’s Clinic and was a collaboration between a science communicator, scientists, artists, medical doctors and writers. “Where Science Meets Fun” is the motto of Genome Adventures. Its main objectives were to communicate, engage and inform the general public – including scientists, industry and business professionals, the media, illustrators, NGOs and policy makers – about this relatively new field of study in Botswana and the African continent. The project organised two workshops, one was a community workshop that brought together scientists, teachers, industry and business professionals, government officials, young people and a few community representative to exchange ideas about genetics or genomics. It is often difficult to bring people from different backgrounds together in one workshop and introduce a difficult and technical subject such as genetics. Difficulties also arise when there is not adequate terminology within the local language to explain some of the complexities of the subject. The facilitator faced the challenge of having to find a language that would work for all participants. Once this obstacle had been overcome the next challenge was where to begin. A starting point was needed that would allow the workshop participants to access and relate to the subject matter. An obvious starting point was to start the group thinking about parents and children, and how, from birth, babies carry traits from both parents, something most participants already knew to be the case. After establishing the understanding, scientists were able to gradually explain what genetics and genomics are and the links between genomics and health. The second workshop brought together the scientists, illustrators and journalists. Harry Dugmore facilitated the workshop and his role was to engage the participants with genetics and links to health issues. For both workshops, in order to get a measure of whether the engagement method was effective, we conducted test before and after the workshops. Participants had to take the first test before starting the interactions, and take the same test at the end of the workshop. Our target was to improve knowledge and understanding among the participants by 20 percent. The knowledge improvement was 13 percent for the community workshop and 24 percent for the media workshop. The Botswana-Baylor Children’s Clinic put together a Community Advisory Board (CAB) that constituted of various community representatives such as church and faith leaders, human rights leaders, minority groups representatives and scientists. This group met on monthly basis to review the processes of the CAfGEN project including the creation of the Genome Adventure project. This process ensured as far as possible that the outputs being produced were acceptable to the community. The comic books were an integral component of the project. The process of production of the comics was inclusive. Scientists shared their knowledge and scriptwriters, medical doctors and volunteering visiting students from overseas made contributions to developing analogies that could work in the scripts. The scripts were shared with the CAB members to get their input. The comic book series follows the story of young man named Kitso who is HIV positive. While at the clinic for his monthly consultations, he is introduced to a new study on genomics but, although interested in it, does not understand why it is important or how it relates to him. Later on at home when he is still indecisive and grappling with understanding the study and whether he should participate, superheroes appear with a mission to help him understand the study. They are about to embark on Genome Adventures. While the comics were created based on the study, we used pseudonyms in order to avoid coercing children to enrol in the study. This was a reaction to an ethical concern that the comic books being produced could coerce children into enrolling in the study. It is very difficult not to excite children through the comics and make them feel enthused by the content so we had to ensure we did our best not to associate the content with the existing study to avoid the issue of ethics. This subject is still being explored further. The first comic, titled Genome Adventures: Blast to the Past - Kitso Explores Heredity and Genetics, introduces the subject of genetics. It introduces African methodologies that were commonly used by African ancestors, for example selecting the best traits for animals through breeding as with Ankole cattle in East Africa. The comic shows the similarities between these methods and those of Gregor Mendel, famous for his illustration of genetics through the breeding of peas. Lastly it showcases the contemporary science on genetics by introducing the work of James Watson, Francis Crick and Rosalin Franklin. In the second comic, Genome Adventures: Cracking the Code - Kitso Explores DNA and Genes, the young Kitso is shrunk to the size of a molecule and sent on a mission to explore how DNA works. 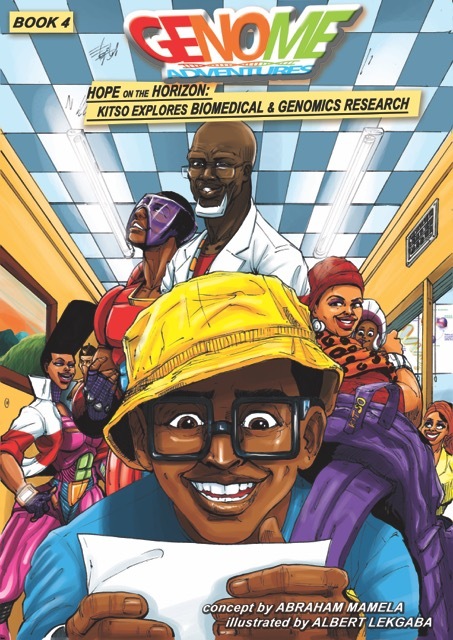 In the third comic, Genome Adventures: Decoding Disease - Kitso Explores Genomics and Health, Kitso travels to regions where there are diseases such as sickle cell anaemia and learns about the HIV virus and why some people are not affected by it. Lastly, in the Fourth book, Genome Adventures: Hope on the Horizon - Kitso Explores Biomedical and Genomics Research, Kitso learns about research ethics and the importance of a genomics study. Before the comics were printed or finalised pilot studies were carried out in order to measure the effectiveness of this medium in engaging people with science. The feedback from these pilots showed that comic books could be an effective means to present scientific subjects such as genetics. Students were given a test before reading the comics and then after reading the books were offered the same test again. In the majority of the schools the results showed an improvement in the test outcomes after reading the comics. The team conducted a pilot study at Nanogang Junior Secondary School on November 26th 2015 to assess the understanding and acceptability of the second comic book in the series. The average pass rate before reading the scripts was 71% and it increased to 90% after reading the scripts. This indicates a good understanding and knowledge increase. In general girls performed better than boys in both test. Focus group discussions were also conducted and during these discussions the majority of students preferred comics as a teaching method than their traditional teaching of science subjects. In all the schools that we conducted students indicated they would prefer comics as a medium to supplement their textbooks. The project planned to use social media and radio as platforms to engage and inform the general public by posting the digital comics books on Facebook, Twitter, a dedicated blog and Pinterest. The Facebook page received over 1890 likes between November 2014 and July 2016 with over 36000 people reached on Facebook. By reached we mean people who visited the Genome Adventures page, viewed posts, shared or like posts; more people viewed the page than liked it. Interesting to note was that the page reached more people outside of the Gaborone area than locally and in fact more people from Kampala, Uganda were engaged than the host city Gaborone. Even though many people were reached, fewer people commented on the posts than we expected. Despite running a competition on Facebook to try to help people participate online the number of people who commented or gave any feedback on the project remained low. This was before the comic books were posted on Facebook. After the comics were posted the majority of the comments were in appreciation of the drawings and level of skill or the project itself rather than the science, implying that the subject matter was still too complex for the audience to fully engage with. Other media platforms did not receive as much traction as Facebook. Twitter received less than twenty followers by December 2015 and the blog has seen less than fifty people vising the project. Working with scientific language that is technical can be very difficult when translating it to layman’s terms, especially when the local languages do not have terms such as “genomics”. To overcome this, facilitators must develop their own terms and it often works best to make these descriptive. Genome Adventures brought together a team that constituted scientists, a science communicator, artists, medical practitioners and a range of others. It was a very diverse team with different parties used to different working environments, timetables and structures. Artists, for example, often have their own style of work, with some preferring to work at night or weekends. After working all night, attending meetings in the day may not be their priority, but others in the team might expect this to be a convenient time to give feedback on their work as they run on more conventional working hours. Creativity also cannot be rushed and whilst partners may be initially excited about the project the level of excitement does wane as time goes on which can hinder project progress. I also found that researchers were more guided by outputs and activity than process and put perhaps disproportionate expectations on these aspects of the project shifting the project from its initial objectives. If you are going to be working with artists, scientists, the community advisory committee and others, it is possible that after the artist produces work, someone else in the team might not like the artworks and may reject the work. This is likely to bruise the artist and their motivation levels might drop hence hindering their future work. The communicator and engagement professional must become the bridge between these people and manage their expectations. Their role is to lead the project and direct it towards its objectives, without bias and whilst facilitating the relationships at play. This is not an easy role and there are various factors that can affect its success: a lack of respect for the role of the engagement professional, or indeed any other role within the project, from partners or superiors, a lack of appreciation of the expertise needed to effectively understand engagement and the needs of the public, or clashes in personality between team members that cannot be resolved. To help avoid the above issues roles in the project need to be clearly defined from the beginning. Working on creative projects can be stressful when it comes to who owns the intellectual property of the work produced. In engagement projects that are based on existing research projects, researchers and host organisation may feel it is their project since they are hosting it, but the artists may conversely feel it is their project because they conceived of and created the final work. The issues of intellectual property must be clearly defined at the beginning of the project to avoid misunderstandings and disagreements further down the line.